Citing the increase in her party's vote share in the Maharashtra Assembly poll, BSP chief Mayawati today said she was not disappointed by the results and asserted that the BSP would play the role of a "kingmaker" in the next state elections. BSP chief Mayawati during a press conference in New Delhi on Monday. British Chief of General Staff, Lieut-Gen Sir Mike Jackson, who is on a 10-day visit to India will hold discussions with Indian defence officials regarding enhancing bilateral defence cooperation. United Kingdom’s top General, Sir Mike Jackson, who is currently on a four-day official visit to India, will be visiting Chandigarh on October 20, and the Line of Control in Jammu and Kashmir a day later. The NCP Legislature Party meeting today authorised President Sharad Pawar to take a decision on the issue of chief ministership in Maharashtra after the Assembly elections which saw the party and its ally, Congress, emerging victorious and locked in a tussle for the top post. Shiv Sena chief Bal Thackeray today blamed the Muslims and migrants to Mumbai and neighboring areas for voting tactically to defeat the saffron combine in the Maharashtra Assembly elections. The Union Home Ministry has offered safe passage and full security to NDFB chief D.R. Nabla, now in Bangkok, to come to India for talks. A senior official of the Special Branch Department said that going by the reports received by the Union Home Ministry and the state Intelligence Department, D.R. Nabla is expected to come anytime by the third week of November. Punjab Chief Minister Captain Amarinder Singh today offered to resign if the Shiromani Akali Dal was able to prove that he had taken “even one rupee.” “I have taken a categorical stand on corruption, a lot of bigwigs are involved in it and this looks like some sort of retaliation. The Supreme Court has rejected a petition, seeking a direction to the Centre and the state governments for the setting up of national and state-level Backward Classes commission, saying the matter should first be explored with the government. Prime Minister Manmohan Singh will head the newly constituted National Committee on Rural Infrastructure. Indicating a hardening of stance on the Naxalite wish list, Chief Minister Y.S. Rajasekhara Reddy today lambasted the CPI (Maoist) Party (erstwhile People’s War) for “playing to the gallery” through its impractical and unreasonable demands. Hitting out at the UPA government, the All-India Trade Union Congress has alleged "corruption and malpractices" in the Labour Ministry which has "failed to discharge its duties". To the Marxists, Durga puja is no longer any taboo and accordingly, the CPM leadership in Bengal has directed the comrades all over the state to utilise the forthcoming Durga puja, which is Bengal’s national festival, as an instrument to develop further contacts with the people for bringing them to their party’s support. A Military court holding general court martial proceeding against an Army officer, accused of faking killings of enemy troops in Siachen last year, today watched video of the staged encounter. The Election Commission team today left for New Delhi after completing its probe into the allegations of rigging by the ruling Samajwadi Party in the Mainpuri Lok Sabha byelection. In a move to topple the Congress-controlled Delhi Sikh Gurdwara Management Committee, the two bitter Akali parties in the Capital have joined hands and served a notice to the committee to conduct the poll for the annual Executive Board before November 2. Everyone remembers the Bollywood megahit, “Lagaan”, which figured in the list of films nominated for the Oscar. The story of “Lagaan” was a brave show by villagers against the British in the form of a cricket match. The government has revised the limit on House Building Advance (HBA), that is the maximum admissible amount, cost ceiling, etc., following the merger of dearness allowance with basic pay. New Zealand Prime Minister Helen Clarke indicated today that she saw a bigger role for India in the enlarged United Nations Security Council. “We (New Zealand) are working as one of the group of countries led by Mexico — called ‘Friends of UN Reforms’ — and what we are looking for is a change in the Security Council which reflects the 21st century rather than 1945,” she told reporters here. BJP leader Jethabhai Prabhudas Patel, an absconding accused in a post-Godhra riot case, was arrested today after he surrendered before the police, official sources said. In a veiled attack on Chief Minister Narendra Modi, Union HRD Minister Arjun Singh today said it was unfortunate that Hitler was being glorified in Gujarat which had also witnessed a “genocide”. Pakistan High Commissioner here Aziz Ahmed Khan today called on Leader of Opposition and former Deputy Prime Minister L.K. Advani and invited him to visit Pakistan. The meeting lasted about half an hour. The World Bank has decided to significantly increase lending to India to 2.5 billion dollars from $ 1.5 billion last year. “We have decided to significantly increase the lending to India,” said Mr Michael Carter, Country Director-India, World Bank. Mr Tang Jiaxuan, State Councillor of the People’s Republic of China, arrived here today for a three-day visit. Mr Tang was earlier Foreign Minister of China from 1998 to 2003. His current visit is part of the continued high-level exchanges between India and China, a Foreign Office spokesman said. The Charkha Sanjoy Ghose Fellowship for Peace and Development Network has announced three media fellowships for journalists and others writing on peace and development in Jammu and Kashmir and Ladakh. Lok Sabha Speaker Somnath Chatterjee has convened separate meetings with leaders of the Congress and the BJP on October 26 and 28 in a bid to ensure smooth functioning of Parliament during the winter session beginning from December 1. Delhi'ites give a miss to tradition while performing Dandiya. Expressing confidence that the BSP would fare well in the next poll in Maharashtra, she cited the 1 per cent increase in the party's vote share, from three per cent in the Lok Sabha poll to 4 per cent in the Assembly elections in a span of four months. "We are not disappointed with the Maharashtra Assembly election results.... We got 100,500 votes in the last Lok Sabha poll in the state, now our share has gone up to 16,7500 votes," Ms Mayawati told mediapersons here. The BSP fielded 272 candidates in the 288-seat Maharashtra Assembly but drew a blank. In the last Lok Sabha poll, the BSP got 3.06 per cent votes in the State while in the 1999 Lok Sabha and Assembly elections, its share was a mere 0.32 and 0.39 per cent, she said. Ms Mayawati said she was not perturbed that her party had failed to open its account in the Assembly poll as the "BSP is a mission...a movement for the uplift of the bahujan samaj unlike other political parties whose sole aim was to capture power." She also pointed out that all four factions of the Republican Party — another Dalit outfit in Maharashtra — collectively got 2 per cent votes and the Lok Janshakti of Ram Bilas Paswan had to be content with a mere 0.07 per cent. Ms Mayawati referred to the reported statements of Congress leaders that the BSP candidates caused a loss of 30-35 seats to their party. Regarding the Uttar Pradesh Assembly byelection results, the BSP chief put up a brave front, saying that the BSP's two seats came from constituencies which were not the party's strongholds. Although the British Chief of General Staff has been in India since October 15, he was given the official ceremonial welcome today after which he said, “on what is my first visit to India it is evident that the defence relationship between the two countries is in a excellent shape”. “I look forward to working out ways to increase that cooperation when I meet Indian Defence Secretary Ajai Vikram Singh, the service chiefs and other senior members of the Indian armed forces,” he added about his visit, which would be one of the longest by any British defence official to India. The British Embassy here, in a statement, said Lieut-Gen Jackson would discuss joint training between the two defence forces, expanding annual bilateral exchanges, training courses and defence deals, including joint production. Three British royal Navy ships have visited India this year to maintain professional contact between the two navies and a fourth visit is planned for Goa in November, besides five more visits next year, it said. The statement further said that a joint deployment command post exercise — Exercise Emerald Mercury — is also planned for the spring of 2005 in India. The discussions between the visiting British General and the Indian officials would also cover continued annual bilateral exchanges of cadets and students at defence colleges and staff colleges and fresh initiatives to include exercise observers, mountain and jungle warfare specialists, aircrew, logistics experts and training instructors. “The UK and India already cooperate in a number of areas such as improvised explosive device (IED) detection and disposal equipment, ground-based radars and military communications equipment,” it noted. Besides holding talks with the Defence Secretary and the services chiefs, Lieut-Gen Jackson will also visit Army units in Chandigarh, Jammu and Kashmir and Agra. British diplomatic sources here told The Tribune this evening that General Jackson, who was the head of the British Army, would be briefed by top officials of the Western Command in Chandigarh and Northern Command in Udhampur on October 20 and 21, respectively. Sources in the Government of India said General Jackson would be briefed at length on how Pakistan was still using terrorism as an instrument of state policy and how infiltration from across the LoC into India was being orchestrated. General Jackson will go to Srinagar from Udhampur on October 21, where he will first be briefed by the top military brass there and then taken to a guided tour of a section of the LoC. He will also be given a detailed briefing on terrorists’ methods to inflitrate into India from across the LoC and the Indian counter-measures. General Jackson’s designation is UK’s Chief of the General Staff, the rank is equivalent to the Chief of Defence Staff who is the chief of the three Services. He will be the first top British General to visit the LoC. The discussions between General Jackson and the Indian officials will pertain to a host of ongoing programmes of bilateral defence initiatives in such fields as joint training, exchanges, training courses and defence equipment. This is the latest in a series of high-level British military visits to India. Following a number of interactions throughout the summer of 2002, India entertained the Chief of the Air Staff in November 2002, Minister (Defence Procurement) in February 2003, the Chief of the Defence Staff in September 2003, the Chief of the Naval Staff in November 2003, and the Secretary of State for Defence earlier this month. Indian defence chiefs have made 3 visits to UK over the past year. The Indo-UK Defence Consultative Group (DCG), which meets annually, is the formal mechanism for developing the Indo-British Defence relationship. The DCG has three sub-groups, covering military to military contacts, defence equipment and science and technology. 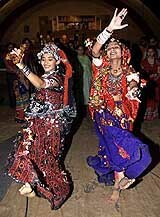 It last met in Delhi in April 2004, and will reconvene in London in mid-2005. According to Mr Jeff Wilson, First Secretary (Press and Public Affairs) in the British High Commission here, defence equipment cooperation between the two countries had gained all the more prominence following the Hawk AJT contract earlier this year and the recent Joint Declaration in London by the two Prime Ministers. He said the UK and India already co-operated in a number of areas, such as improvised explosive device (IED) detection and disposal equipment, ground-based radars and military communications equipment. Besides, in the field of joint training too, a lot of activities have been taking place. Three Royal Navy ships have visited India so far this year to maintain professional contact between the two navies. A fourth visit is planned for Goa next month, and a further five visits should take place in 2005. A joint deployment command post exercise — Exercise Emerald Mercury — is planned for spring 2005, in India, following UK-Indian collaboration on joint operation planning courses (in UK and India) over the course of 2004-05. Newly elected NCP legislators unanimously passed a resolution in this regard. NCP leader Tariq Anwar told a press conference after the meeting that Mr Pawar was empowered to take a decision in the light of the electoral mandate and the political situation in the state. The resolution was proposed by senior NCP leader and former Maharashtra Deputy Chief Minister Chhagan Bhujbal at the meeting held at the party headquarters and seconded by Deputy Chief Minister Vijaysinh Mohite-Patil. The decision assumes significance in the backdrop of an intensified struggle between the NCP and the Congress over the post of Chief Minister. Writing in the Shiv Sena mouthpiece “Saamna”, Mr Thackeray accused the Congress NCP alliance of pandering to Muslims and ‘outsiders’ as vote-banks. “The vote-bank of Muslims and influx of people to Mumbai changed the equations against the saffron alliance,” he said. Mr Thackeray, however, warned that the Congress-NCP’s policy of ‘appeasing’ Muslims would prove dangerous to India. He further accused Congress President Sonia Gandhi of being the architect for playing up to Muslims. “Tomorrow if the country faces a threat from Islamic fundamentalism, Mrs Gandhi would leave for Italy along with her two children,” Mr Thackeray wrote in the front-page piece. Mr Thackeray alleged that the Congress was wooing illegal migrants from Bangladesh as well in a bid to secure votes. “Islamic fundamentalism is spreading across the country at a time when the government at the Centre is weak,” Mr Thackeray said. Cheering up his party workers, Mr Thackeray said he would as usual address his annual ‘Dusehra’ rally at Shivaji Park in central Mumbai. Mr Thackeray said the Shiv Sena’s plan of action would be spelt out during the rally. The Congress was quick to hit out at Mr Bal Thackeray for his comments. Mumbai Congress chief Gurudas Kamat said Mr Thackeray’s statement only betrayed his frustration at not being able to expand the Shiv Sena’s appeal among different sections of society. “We represent all communities. No political party should play politics of exclusion. If Bal Thackeray feels that they haven’t got votes of minorities, he should re-consider his politics,” Mr Kamat said. The meeting may be held either in Delhi or in Assam. It may be mentioned that the NDFB, in coordination with ULFA, organised a series of bomb blasts in Assam and also opened fire in market places, killing 40 innocent persons between October 2 and 5, and then offer a ceasefire on October 8. The official ceasefire letter from NDFB chief D.R. Nabla reached Assam Chief Minister Tarun Gogoi on October 14 night.The NDFB ceasefire, which began on October 15, would continue for six months to pave the way for talks. Mr Khagen Sharma, IG (SB), Assam, left for Delhi yesterday to work out the modalities for talks with the NDFB in consultation with the Union Home Ministry. Although the NDFB is demanding a separate Bodoland, the Centre and the state were in favour of giving more financial and regional autonomy to the Bodo Territorial Area Development (BTAD), currently functional in Lower Assam comprising six districts. The BTAD, formed last year, is being run by moderate Bodo leaders who want to settle all issues through dialogue and not through guns, like the NDFB. Close on the heels of the talks between the NDFB and the Centre, hopes have brightened for talks between ULFA and the Centre, with the recent initiative by Jnanpith Award winner and noted intellectual of Assam Indira Goswami. She is associated with the Department of Modern Literature, Delhi University. Ms Goswami has already gone on record stating that the ULFA Commander-in-Chief, Paresh Barua, now in Bangladesh, often speaks to her over the phone, and was willing for talks too. Indira Goswami will submit a detailed proposal outlining the guidelines for talks to Prime Minister Manmohan Singh by November 15. Ms Goswami enjoys an excellent personal relationship with Manmohan Singh as both of them hail from Delhi University. “I have taken a categorical stand on corruption, a lot of bigwigs are involved in it and this looks like some sort of retaliation. The truth would finally emerge. If it is proved that I have even taken one rupee in the transaction, I will resign that very day,” he told reporters. The Chief Minister made these comments shortly after an Akali Dal-BJP delegation met Prime Minister Dr Manmohan Singh and demanded a probe into the so-called hawala scam in which the two parties had alleged that he and his son were involved. “The demand made by the Akalis and the media reports have political overtones. The timing of the reports alleging my involvement was also politically motivated,” the Chief Minister said, adding that he was ready to face any inquiry. On the Akali Dal demand for a probe by the Enforcement Directorate and the Directorate of Revenue Intelligence into the foreign exchange scam, the Chief Minister said the Central Revenue Intelligence Department had already looked into a hawala scam in which his son’s alleged involvement was being reported in the media. “When the reports of the alleged hawala scam first came out last December, I met the then Union Finance Minister Jaswant Singh and urged him for a fair inquiry by a central agency into the issue,” he said. “The Department of Revenue Intelligence has already looked into the whole issue,” Capt Amarinder Singh said, adding that he had also set up a commission which was going into the alleged scam. The PIL was filed by Asaduddin Owaisi, MP from Hydrabad, who contended that in the absence of the National Commission for Backward Classes (NCBC) and state commissions for Backward Classes, the Andhra Pradesh High Court had quashed the state government's order for providing 5 per cent reservation to the economically backward Muslims in Andhra Pradesh recently. "You (Owaisi) as a Member of Parliament, representing an important constituency, should first approach the Union Government for appointing such bodies," Mr Justice Y. K. Sabharwal and Mr Justice D. M. Dharamadhikari, in an order passed on Friday, said. The Bench dismissed the petition after Mr Owaisi's counsel, senior advocate Ramchandra Rao, admitted that the MP had neither discussed the issue with the government before approaching the apex court, nor raised it in Parliament. The Bench, however, said the petitioner could approach the court after he had raised the matter with the Union Government. Mr Owaisi in his petition cited the Supreme Court's 1992 judgement in Indira Sawhney case, wherein it had felt the need of constituting national and state level commissions for backward Classes as permanent statutory bodies to deal with any complaints relating to the discrimination of backward classes. The PIL said the Muslims, who were socially, educationally and economically backward, should be included in the list of Backward Classes, as they were not getting "adequate" representation either in government jobs, or in educational institutions. "Without constituting the National Commission for Backward Classes, it would not be possible to provide ameliorative concessions to the downtrodden," the PIL said. The Bench said as an MP, he was better placed to convince the government on the issue than preferring to move the court without exploring the possibility. 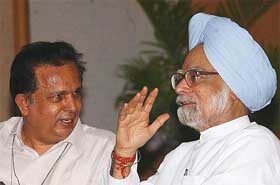 Prime Minister Manmohan Singh will head the newly constituted National Committee on Rural Infrastructure (NCRI). The committee will initiate policies to ensure time-bound provision of quality infrastructure in rural areas, including roads, power irrigation, water supply, housing and telecommunications. The NCRI will also identify innovative financing arrangements pooling central, state and private funds for projects in these areas, an official release said. During the ongoing discussions the extreme Left-wing party demanded that the government should confiscate all land in and around Hyderabad under the control of various business and industrial houses for distribution among the landless. “I have a feeling that the Naxalite leaders are trying to play to the gallery with such demands. All these are not agricultural lands and secondly, we need land for industrial development too. If the government had given away land for industries, what is there to inquire into,” Dr Reddy wondered. During the parleys in the past three days, the Naxalite leaders came out with a variety of demands such as snapping ties with the World Bank, lifting of all cases against revolutionary activists and leaders, release of political prisoners and providing land to the landless poor. Alleging that thousands of acres of agricultural land around the capital city was passed on to the rich and the powerful, the revolutionary party leaders yesterday handed over a list of the business houses, including the Ramoji Film City, Raheja Estates and L & T to the government representatives, demanding that these be taken over by the government for distribution. The government side told the Naxalites yesterday that it would constitute a commission to look into ceiling and government lands. Reiterating his stand that the armed outfit could not go around with weapons during the ceasefire period, the Chief Minister said the ongoing efforts at rapprochement with the Maoists was aimed at bringing them into mainstream politics. “The talks can only go within the framework of the Constitution and everybody including Naxalites will have to abide by it,” he asserted. On DGP Sukumara’s sharp reaction to the Naxalites’ demand for increasing the pay of police personnel, Mr Reddy justified the police chief’s response. The DGP said it was none of Naxalites’ business to talk about the internal matters of the Police Department. Meanwhile, on the fourth and concluding day of the first phase of the talks, Naxalite leader Ramakrishna said the schedule for the next phase of the talks would depend on the government’s response to their demands. The Labour Ministry which has to play a crucial role in the implementation of the UPA government's Common Minimum Programme cannot be allowed to go astray, AITUC General Secretary Gurudas Das Gupta said in a letter to Prime Minister Manmohan Singh. "The Employees Provident Fund Organisation is in doldrums. Complaints are numerous with respect to the payment of pension, never before there was a talk of corruption, malpractices and favouritism in the functioning of the (Labour) Ministry as is today", the letter said. He alleged that the meeting of the standing committee on labour has been indefinitely postponed and no fresh date has been fixed. "The highest forum of tripartite consultation is not being activated, thereby the system of tripartism was being given a go-by and issues concerning labour are denied proper attention", the letter said. As one of the members of Parliament who has been associated for long with the functioning of the consultative committee of the ministry, "I am constrained to say that the Labour Ministry is failing in the discharge of its duties", he said in the letter. Only two or three years back, the party’s participation in any religious festivals or any birthday celebration of any national leaders like Mahatma Gandhi and Netaji was a complete ban. The CPM leaders and workers were also debarred from observing the birthday celebrations of Rabindranath, Vidyasagar and Rammohan Roy. However, the situation has changed now and the party itself has been sponsoring the Rabindra Jayanti, Vidyasagar Mela and Subhas Mela in the city and elsewhere for which the politburo leader, Biman Bose has been officially authorised to take the leadership. Never before the CPM had come out in the open to take part in any religious festivals like the Durga puja or Saraswati puja or Divali. In the past, the CPM used to organise different stalls near the puja pandals from where they sold the party publications, books and pamphlets on Marx, Lenin, Che Guavara and the history books on the world’s communist movements. Now for the first time, on the eve of the elections of the party’s state committee and various other district, zonal and local committees, the comrades were asked to take part in the religious festivals like Durga puja, Divali. Anil Biswas, the party’s state secretary, said in the changing political situation in the country, it was necessary that the party comrades developed further contact with the people and made these festivals instrument for the forthcoming elections. In Kolkata, leaders, Somen Mitra, Mamata Banerjee, Subrata Mukherjee, Ajit Kumar Panja and other Congress(l) and Trinamool Congress MPs,MLAs and municipal councillors had taken an active part in organising Durga puja and Kali puja in their respective localities. Now, the CPM had come out openly in getting them involved in organising several community pujas in the city and the districts and the leaders like Biman Bose, Subhas Chakraborty, Shyamal Chakraborty and Anil Biswas would be associated with those community pujas. Prosecution played the seven-minute video in the court while examining eyewitness Naib Subedar Phatta Bahadur Thapa who narrated the entire sequence of events of the fake encounters staged by Maj Surinder Singh in August and September last year. The witness also identified the voice in the video of that of Maj Surinder Singh and landmarks shown in the video shoot. The seven-member jury headed by Brig A.D.S. Grewal overruled the objections raised by defence counsel R.S. Randhawa that there was no justification in showing the video to the witness. Similarly, the objection to voice identification by Naib Subedar Thapa on the ground that the witness was not an expert was also overruled. The presiding officer of the court overruled the objections after hearing the advise of judge advocate S.V. Rao who opined that the objections were not tenable. Earlier in the day, the team reviewed the documents in connection with the byelection in the Mainpuri, Karhal, Kishani and Ghiror Vidhan Sabha areas of the constituency where the byelection was held on October 13. It later visited the Jasrana Assembly segment in Ferozabad district, which forms part of the Mainpuri constituency. The team also recorded statements of the voters under several polling booths to verify the entries made in the polling documents. The notice has been signed by 34 members of the 51-member DSGMC. It says if the DSGMC president fails to hold such an election, the signatories will hold the said election for the Executive Board on November 17. The signatories have quoted Section 19 (1) of the Delhi Gurdwara Act, 1971, which states that annual general meeting is required to be held to hold the election of president, officer-bearers and members of the Executive Board. The term of the present executive ended on September 24. However, the incumbent president, who is a member of the Congress, Mr Prahalad Singh Chandhok, deferred the election till January 27, 2005, on the ground that sufficient number of persons had not sought the holding of poll. The signatories included Shiromani Akali Dal (Badal) chief Avtar Singh Hit and the Shiromani Akali Dal Delhi president Paramjit Singh Sarna. The coming together of these two groups is being viewed as a significant step as infighting between the two groups had led to the installation of Congress candidate to head the DSGMC in the Capital, which has the maximum number of Sikhs in a city in the world. However, Mr Chandhok failed to honour the unwritten understanding he had reached with Mr Sarna and opposed all moves to hold poll for the Executive Board when he completed his term. Mr Chandhok’s move to honour 1984 anti-Sikh riots accused has irked many and the Shiromani Gurdwara Parbandhak Committee has summoned him for an explanation. Agitated by the actions of the DSGMC president and his office-bearers, the two groups have joined hands to topple the Congress control Sikh body. Mr Chandhok, rival Akali factions say, does not enjoy the support of the majority of DSGMC members as two-third of the members have signed the notice to call for an election. The small town of Phulagari at Nagaon in Assam could have inspired another “Lagaan”. Instead, it has been confined to the history books till now, the courage of its peasants an almost forgotten chapter. The epochal Phulagari Dhawa of 1861 came alive in concrete when a memorial was unveiled today to commemorate the peasant uprising there. As in the film “Lagaan”, which told the story of a rebellion against heavy taxation by the British, the unrest at Phulagari was against the British decision to impose a heavy land tax and ban the cultivation of poppy. The memorial has been built at the very place — on the bank of the Kolong river — where thousands of farmers had gathered to launch an agitation against the British. Just as the meeting started, the then Deputy Commissioner of Nagaon, Captain Singer, reached the spot on a horse with a large number of troops. Captain Singer rode straight into the jaws of death. The angry peasants stabbed him to death and threw his body into the Kolong river. The incident triggered a brutal retaliation by the Raj — several of peasant leaders were arrested and condemned to death — but the seeds of the movement for independence were sown in the region. A district administration official said the memorial depicted peasants fighting British soldiers. Near the triangular memorial at Phulagari, 20 km from Nagaon, would be a community hall, the foundation of which was laid during the inauguration of the monument today. The maximum limit for grant of HBA has been revised to 34 months’ of basic pay and dearness pay taken together in place of existing limit of 50 months’ of basic pay subject to a maximum of Rs. 7.5 lakh or cost of the house or the repaying capacity whichever is the least, for new construction/purchase of new house/flat. The maximum limit for grant of HBA for enlargement of existing house has been revised to 34 months’ basic pay and dearness pay taken together in place of the existing limit of 50 months’ basic pay subject to a maximum of Rs 1.8 lakh or cost of enlargement or repaying capacity, whichever is the least. The cost ceiling limit is revised to 134 times the basic pay and dearness pay taken together in place of the existing limit of 200 times the basic pay subject to a minimum of Rs 7.5 lakh and a maximum of Rs 18 lakh relaxable up to a maximum of 25%. The fresh guidelines are effective from October 10. Ms Clarke was making the comments when asked if her country was supportive of India’s bid for a permanent seat in the Security Council. Ms Clarke is on a five-day official visit to India, the first in almost two decades by a New Zealand Prime Minister to India, after Mr David Lange’s trip in 1985. “We had information that he (Patel) had returned from Maharashtra after the Assembly elections and kept a watch near his house. He surrendered to the police when told that he had no other option,” Inspector R.P. Chaudhary said. Mr Patel, who is a BJP leader from Sabarkantha district of north Gujarat, was produced before the Chief Judicial Magistrate who sent him to judicial custody. “It is unfortunate that in this land of Mahatma Gandhi, one of the most brutal genocide has taken place which shamed the whole nation. Moreover, what is surprising is that in this very land Hitler is being glorified rather than Gandhi,” he said while addressing students at Gujarat Vidhyapeeth’s convocation here. The meeting comes days after reports wherein Mr Advani had said he would visit Pakistan, if invited. In the past two or three years, the bank has been lending $ 1.5 billion a year to India. This year, ending on June 30, 2005, the lending would be enhanced to $ 2 billion and this can go up to $ 2.5 billion, he said. Mr Carter said there might be a further increase in lending next year. He said the multilateral funding agency has decided to increase lending to India in the wake of initiatives that the government is taking in the fields of infrastructure, human development and rural development. World Bank President James Wolfensohn had assured Finance Minister P. Chidambaram during his recent visit to the US that the bank would rise lending to India if adequate infrastructure projects were undertaken. Among the infrastructure sectors identified were electricity, seaports, airports and railways. In September, the World Bank had approved a $ 400-million package of assistance for the development of rural roads in India. State Councillor Tang will hold official talks with the External Affairs Minister, K. Natwar Singh tomorrow and the two leaders will review recent developments in India-China relations and exchange views on the further improvement of bilateral relations. Mr Tang will also call on Prime Minister Manmohan Singh and meet National Security Adviser J.N. Dixit. The fellowships amounting to Rs 50,000 each for six months will be open to those writing in English or Urdu in the age group of 25 to 40. The fellowships will be screened by the Editor-in-Chief of The Tribune, Mr H. K. Dua; former BBC Correspondent Mark Tully; Principal, Lady Shriram College, Meenakshi Gopinath; Ms Sushoba Barve, activist and writer; Mr Pushp Saraf, Adviser, Excelsior; Mr Muzzamil Jaleel, Bureau Chief, Indian Express, Srinagar; and senior journalists Mohammad Sayeed Malik and Usha Rai. Charkha, an NGO, was established by social activist Sanjoy Ghose to enable the voices of the marginalised and disadvantaged to reach the opinion leaders and policy makers through their writing in the media. Applications for the fellowship can be sent to Ms Ashima Kaul Bhatia at the Charkha Sanjoy Ghose Fellowships, Charkha Development Communication Network, G-15/11-12, Malviya Nagar, New Delhi, by the November 12, 2004. This comes ahead of the November 8 meeting of leaders of political parties that Rajya Sabha Chairman Bhairon Singh Shekhawat and the Speaker have convened. The Speaker will be meeting leaders, deputy leaders of both the Houses as also Chief Whips of the Congress on October 26 and the Leader of the Opposition, Mr L.K. Advani, and his party colleagues on October 28 to have a detailed discussion on the matter.